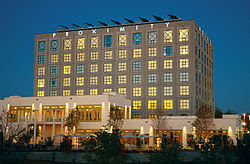 Proximity Hotel, a Platinum LEED Certified Hotel in Greensboro, North Carolina. A green building is not exactly the most profitable investment for businesses in the retail and hospitality industry, but retail stores and hotels are nonetheless making the big move. In fact, the Green Retail and Hospitality SmartMarket Report by McGraw Hill reports that over half of projects in the industry will be green come 2015. Green buildings, including steel buildings, have grown tremendously over time, and in the past two years alone, its growth rate has almost doubled. Green projects, classified as those with LEED certification or any other green building standard, and characterized by high resource efficiency, have especially made their way into the hospitality sector. In 2011, green projects jumped by 18%. This was followed by an even more tremendous growth in 2013, at 38%. This is expected to hit 52% by 2015. The same goes for the hotel industry, where 28% of hotel owners turned “green” in 2011, leaping to 48% growth in 2013. The figure for green projects is expected to rise to 62% by 2015. There is a reason why investing in green buildings is especially difficult for the hospitality industry. Unlike other businesses, turning green comes at no cheap cost for restaurateurs and hoteliers. With more extensive HVAC requirements, the constant presence of occupants, and a unique franchise ownership model, it is definitely more difficult initially to convert to green building methods within the hospitality industry. But it is something that needs to be done, considering the many financial benefits that can be gained from it. For one, it increases asset values for retail stores (7%), restaurants (12%), and hotels (11%). It also increases building return on investment and decreases annual operating costs. This last benefit, energy efficiency, is the reason why most owners have been turning green. More than half (58% for restaurateurs and 67% for hoteliers) reported that turning green resulted in more efficient energy use with an average decrease of 15%. Another benefit is higher occupancy rates. Most hotels report higher occupancy because of their green efforts. Customer satisfaction also increased by 69%. It is difficult to ignore these glaring benefits of green buildings over time if you are a hotel or restaurant owner, so when will you finally make the change?